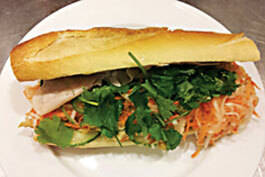 Vietnamese banh mi sandwiches are typically filled with pork, but at the corporate cafes managed by this caterer, chicken is layered on the crusty French bread instead. The term "banh mi" actually just refers to bread, but this sandwich stands out with its lemongrass-flavored chicken and a garlic-based mayonnaise. For banh mi mayonnaise: Combine all ingredients in food processor and puree. For lemongrass chicken: Heat saute pan. Add oil and saute lemon grass, garlic, onion, turmeric and curry until soft. Transfer to food processor and puree, adding some water to thin out. Marinate chicken thighs for 4 to 6 hours in mixture. Sear off and finish in 325 F oven, until internal temperature reaches 160 F.
Remove from oven, cool down and slice. For service: Cut French bread in half, spread banh mi mayonnaise (recipe follows) on both sides of bread. Layer cucumbers, then lemongrass chicken (recipe follows), peppers, pickled daikon and carrot, ham and cilantro leaves. Toast in oven or panini press.